Do you trust your news? Van Helsing pointed this out. Others have done the research and discovery. I'm just going to present the evidence to you. This is to show media bias and how it can be carried out. Here's the news!!!! WASHINGTON, D.C. -- Millions of people jobless. Billions of dollars in bailouts. Trillions of dollars in U.S. debt. And yet, for the first time in years, more Americans than not say the country is on the right track. In a sign that Barack Obama has inspired hopes for a brighter future in the first 100 days of his presidency, an Associated Press-GfK poll shows that 48 percent of Americans believe the United States is headed in the right direction — compared with 44 percent who disagree. The “right direction” number is up 8 points since February and a remarkable 31 points since October, the month before Obama’s election. Not reported was the sample of people polled. 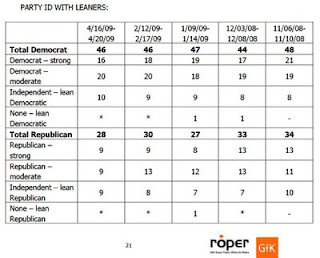 So the poll shows that there are 2 Democrats for every 1 Republican in the survey. Let's assume a sample size of 100 people to make the math clear. That would be 66 Democrats to 33 Republicans. 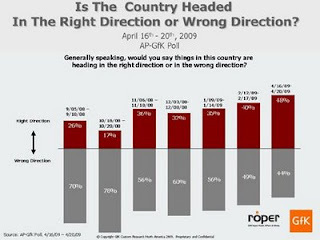 Even with 66 to 33 ratio, only 48% of those surveyed thought the country was going in the right direction. The data implies that there were just as many Democrats that thought the country was going in the wrong direction as there were total Republicans surveyed. Another implication of the data is that 100% of the Republicans thought the country was going in the wrong direction. But the worst implication is that this is exactly why the AP slanted their data so strongly. They knew their story was a lie. But that's not all. Because if 50 Republicans and 13 Democrats (in our extrapolated sample) thought the country was going in the wrong direction, that would mean that only 37 percent thought it was going in the right direction. We got there a bit early. The program was to start at 3pm. Doug Lindgren gave the welcome address. Diane Johnson sang the National Anthem. Doug led the Pledge of Allegiance. Barb Chervestad (the main organizer) gave an address titled "What's the Tea Party All About?" I read the Preamble and some of the Amendments to the Constitution of the United States. Tom Schafer read a "Declaration of Grievances." There were several other scheduled speakers. There were also many who came to the open mike. Mary made signs for our kids based on the Preamble. "Secure the Blessing of Liberty For"
According to Jeff Quinn of Gun-Blast.com Cimarron Firearms Co. of Fredericksburg, Texas makes some of the best and most consistently accurate historical reproductions of Colt revolvers. I picked up a used 5.5" Single Army Action Colt pattens 1871, 1872, and 1875. The model name stamped on the barrel is "el Pistolero." Disassembly/reassembly and cleaning are very easy. The metalwork and woodwork are beautiful. The case hardened frame fades in and out from blue to purple to gold. The brass lowers frame the rosewood(?) handle. Here is a view with the loading port open. This .357 mag can fire .38sp, .38sp+p, and .357mag. There is hardly any recoil with .38sp, very little recoil with .38sp+p. Recoil with the .357mag is pretty strong. You can check the differences in pressure on these loads at this site. What a nicely made piece of history. 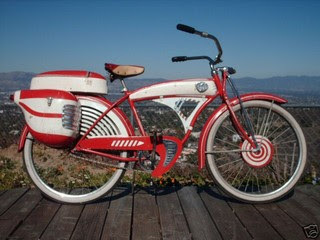 I got it inexpensively enough that I could re-sell it right now for more than I spent. But I think I'll hold on to it for a while. I had 4 services last weekend. Last service at St. Petri. Tuesday we had Winkel at Ulen. Pr. and Mrs. Dale fixed a really good lunch. Our kids had fun together. I presented on the texts for Easter 2 on the basis of the original languages. Wed we had wed school. Wed eve and Thursday hospital visits, Marlow A was hospitalized this week with the Norovirus. She's doing better. Got to a few shut-ins. And found a deal on a Cimarron SSA .357 mag 1875 Army revolver (el Pistolero). It matches my Winchester 94. And on checking around on the net, it looks like I could sell it for more than I spent on it. Laura D. I'm going to need some help learning how to cook the rice better and in spreading the rice on the kelp. It tasted good. Thank you. Cucumbers, peppers, garlic, dill, saltwater. Let sit on counter at room temp for 3 to 5 days. Eat or refrigerate. Keeps 6 months refrigerated. For the pickled eggs, the after Easter sales provide a cheap source. Hard-boil the eggs, add some garlic, mustard seed, peppercorns, cover with white vinegar. Refrigerate, wait a week or better before eating. Keep 6 months in fridge. Grandpa E. had eye surgery this week. He also has Atrial Fibrillation. Please keep him in your prayers. He needs to be still for 10 days while his eye heals. Not an easy thing for a man that has always been busy doing things. The week before Holy Week: Sat 1 service, Sun 3 services; services, Bible Study, and Wed School from Tue, wed, thur, Funeral visitation prayer service on Friday; Sat regular worship, then funeral for Alverra O. (11 services 3 Bible Study, 1 WS) Holy Week I held 3 Palm Sunday services, 1 Wed. Service, 2 Holy Thursday services, 2 Good Friday Tenebrae services. 1 Holy Saturday service, 3 Easter Sunday services. (plus 12 Services, 1 WS) I also checked in on a few shut-ins during the week. It was pretty steady. I was getting a bit frazzled (28 regular/non shut-in preaching/teaching obligations in 15 days). Mom and Dad came Friday in the afternoon, bringing Jeremy with. The little kids kept climbing all over their oldest brother. Monday morning, Mom, Dad, and Jeremy went back to Belview. In the afternoon we left for the cabin. We stayed at the cabin until Wed. morning; and took a leisurely drive home through Park Rapids, Bemidji, Shevlin, Bagley, and Fosston. Louisa has some entries on it in her blog. Thursday I took Matt to TRF so he could buy himself a bicycle. It had been stored in the basement of the Alamo. Late Thurs eve and Friday, sermon work, lesson planning; writing; reading for work. Monday we took off for a cabin by a lake. 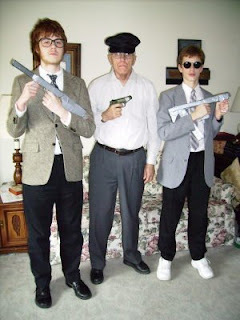 Grandma, Grandpa, and Jeremy came for Easter. During the prep for the candy hunt we had one child who sneaked to the top of the steps to spy on the prep. We had the hunt downstairs. Donna, can you find the purple eggs? Here are the kids this Easter. This Bald Eagle was sitting at the edge of our yard on Holy Saturday. This is who Obama believes is best to represent religious faith. Harry Knox, a professed gay Christian who is director of the religion and faith program at the Human Rights Campaign, a homosexual rights group, was named to President Obama's Advisory Council on Faith Based and Neighborhood Partnerships on Monday. I can't imagine a more arrogant choice. But this is exactly what we should expect.